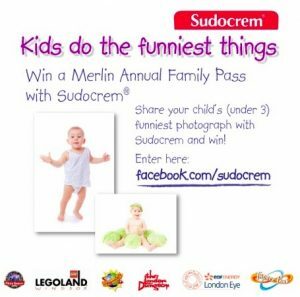 To celebrate the launch of their new website and social media channels, Sudocrem are offering a 12 month Merlin Family pass worth nearly £400 to a parent who shares with them the funniest photograph of their child. (currently under 3 years) Please note submissions must not relate in any way to the use of Sudocrem Antiseptic Healing Cream. 1 – It’s simple – just ’like’ the Sudocrem Facebook page. 2 – Upload your child’s funniest photograph and describe the story behind it. 3 – The winner will be announced on Monday 21st March 2011. Pop over now for more details. Good Luck.